Spider-Man faces off against a new villain in mad scientist Doctor Octopus. Meanwhile, Peter is having trouble reconciling his feelings for Mary Jane, which is causing performance problems with his super powers. "Spider-Man 2" is once again directed by Sam Raimi who, besides working on the previous "Spider-Man" film, has also directed films like "The Quick and the Dead" and "For Love of the Game." Tobey Maguire returns as the titular character of Spider-Man/Peter Parker as he struggles to make it on his own in New York City. Also returning are Kirsten Dunst as Mary Jane Watson, who is still very much the object of Peter's affection, though being with her would mean putting her life in danger. Peter's feelings for Mary Jane have caused a massive internal conflict for him, making him have trouble with his powers which, in turn, causes him to abandon his duties as Spider-Man for a period of time. Other actors reprising their roles are James Franco as Harry Osborn, J.K. Simmons as J. Jonah Jameson, and Rosemary Harris as Aunt May. New to the cast is Alfred Molina, who plays Doctor Otto Octavius, who turns into the villainous Doctor Octopus after his fusion experiment backfires and melts down, destroying his lab and turning him into a tentacled beast. Doc Ock begins terrorizing New York City in order to rebuild his destroyed laboratory and continue his research. You know, those wacky Mad Scientists are always up to no good. After the success of "X-Men" and "Spider-Man," more and more comic book films started to get made, some good, some downright awful. 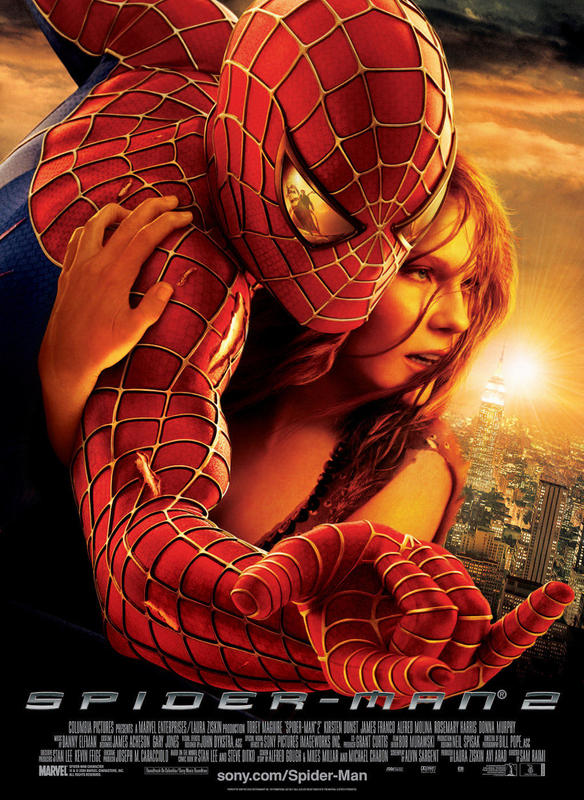 "Spider-Man 2," however, is the one that raised the bar for what comic book fans should expect from their movies. This was much to the chagrin of "Catwoman," which came out the following month and took a vastly different, supremely opposite approach, reaching the depths of awfulness superhero adaptations had not seen since "Superman IV: The Quest for Peace." "Spider-Man 2" brings together a solid story with a relatable hero (one of our favorite superheroes ever!) who is just a poor, nerdy kid from Queens looking to do right with the powers he has acquired. In addition, it has a subplot about Peter's feelings for Mary Jane, and the consequences he faces for feeling them. It combines these human elements with an interesting, well-developed villain and doesn't under-utilize him. Doctor Octopus can be seen as a somewhat cliche, crazed mad scientist at his core, but he is still a very intriguing character supported by an excellent, equally crazed performance by Alfred Molina. He nails his performance so well, in fact, that it would be hard to imagine someone else playing this character now. There are some really great showdowns between Doc Ock and the wall-crawler. The scene on the train is still an amazing action sequence, even 13 years later. Despite seeing this movie several times, these tense moments still excite us. It helps that the visual effects for "Spider-Man 2" are brilliant and still hold up amazingly well for a flick that's as old as it is. It's certainly no surprise that this took home the Academy Award for best visual effects. "Spider-Man 2" is a fantastic film. It is still our favorite Spider-Man movie up until this point and it remains one of our favorite superhero flicks of all time. This sequel dives deeper into the human elements of Peter Parker and the people that surround him, which we love, and is surprisingly light and funny in some instances, and deep and darker in others. This well rounded comic book movie boasts better effects, better tension, better relationships, better acting, better characterizations, better everything, and it shows in its final product.